It is very rare that I have left over mashed potatoes. I'm usually very good at estimating quantities for two or three, but I did rather overestimate for our New Year Day lunch and, as well as the left over cauliflower cheese that I used to make Cauliflower Cheese Soup, there was some left over red cabbage and quite a lot of mashed potato. This month, Elizabeth of Elizabeth's Kitchen is hosting Turquoise Lemons' 'No Waste Food Challenge' and it was fortunate for me, she chose 'mashed potatoes' as the ingredient not to waste! 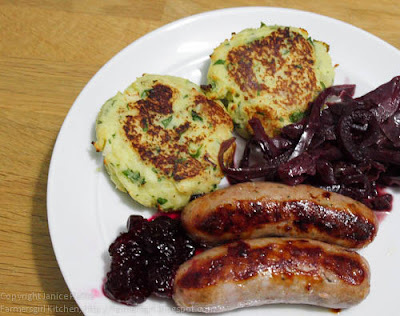 My first thought was that I would make gnocchi with the mash but I had some sausages and the red cabbage that I wanted to use and somehow I just didn't fancy gnocchi with that, so instead I made some homely potato cakes. The quantities in this recipe are approximate, adjust depending on the quantity of mash you have left over. There is no celery in the potato cakes, it was on the work surface and somehow ended up in the photo! 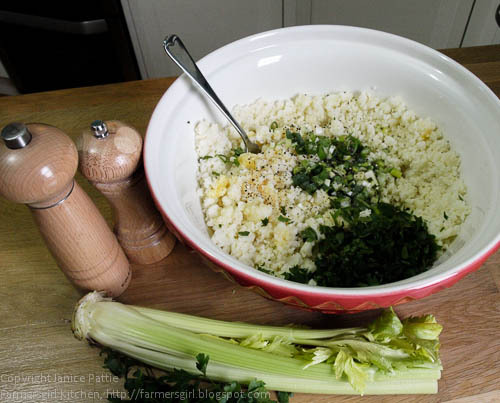 Put the mash in a bowl and if it is cold and clumped together, break it up with a fork. Add spring onions, parsley and seasoning and a little plain flour, I only needed 1 dessertspoon for this large bowlful of mash. Mix this until it is evening distributed. Add beaten egg and mix together, I used two eggs to get the mix to the right consistency. 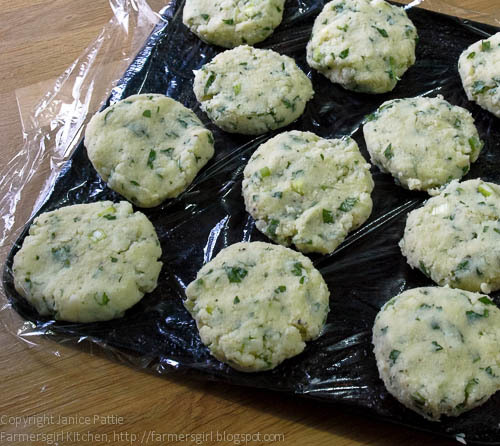 Form the potato mixture into cakes and place on clingfilm on a baking tray. Place in the fridge for at least a couple of hours until it firms up. Heat a little oil in a non-stick pan and fry a few potato cakes at a time, turning after a couple of minutes. When they are browned on both sides, place on a baking tray and place in the oven at 180C for another 10 minutes to make sure they are hot all the way through. I've made potato cakes before, but usually they fall apart, I think the little bit of flour and the fridge chilling was the key to them holding together, you could add other things to the mash, but no big pieces or they will definitely fall apart! Mmmmmmm, lovely. What great leftovers to have. Now I am craving cauliflower cheese! Oh I LOVE potato cakes, they are just delicious on their own with a knob of butter, yours are lovely! 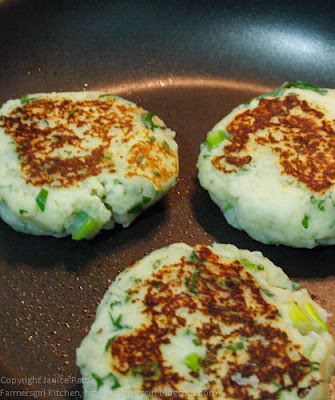 My mom used to make mashed potato cakes for us when we were children. I loved them then and I love them now. Thanks for reminding me how lovely they are! Those potato cakes look lovely. I would do the same with my leftovers. That first photo of the plated food has ALL of my favourite ingredients on it! Proper LUSH! Potato cakes - I haven't had those in ages. They look great!